Just before Christmas scientists warned that West Antarctica was warming twice as fast as expected, and three times faster than the average for the planet as a whole. The Arctic summer sea ice fell to its lowest extent ever, way lower than any scientific study or climate simulation, including UN and ICCP, had anticipated. For the first time ever there was melting on the whole surface of Greenland. Wildfires in the tundra and many other places where more frequent than ever. De-forestation and fires emitting huge quantities of CO2 brought Indonesia to third place among the world’s largest emitters of greenhouse-gasses. In many places the drought situation led to extremely low cereal-production causing prices to sky-rocket and the overall supply-situation is still at a very critical level. There is absolutely no doubt, climate-change is here! More than 99% of all scientists agree that the climate-change is happening and that it is to a large extent driven by man, but still there is a lot of climate-denial, in many cases founded by the fossil-fuel industry advocating “other reasons”. There is also a huge amount of people all over the world that are still unaware of how severe the climate situation is or preoccupied with basic needs such as getting food for the day or surviving catastrophes or avoiding being killed in armed conflicts. 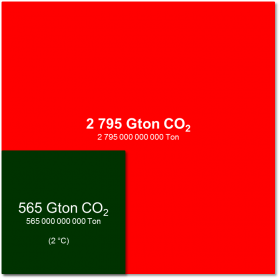 Although we know that to keep the warming of the earth below 2°C there is an estimated maximum remaining “allowance” in the atmosphere of 565 GTonnes of CO2 until 2050, the fossil-fuel industry is pushing harder than ever to “harvest” their known findings of coal, oil and gas – which, if burned, would bring more than 2,795 GTonnes of CO2 into our atmosphere and most certainly bring up the earths average temperature more than 4-6°C – this of course bringing our civilisation directly into a catastrophe!! Knowing this, the fossil-fuel companies are still pushing hard for more exploration, more tar-sand exploitation, more shale-gas drilling. Companies led by people such as the Koch-brothers and Rex Tillerson who even claimed that “the climate-change is an engineering-problem…”. It is not an engineering-problem – it is a Greed-problem! The world economy is challenged in almost every corner of the world. Few countries have low or no “debt-problem”. But still the business schools around the world are graduating young economy-students from education based on theories about debt and eternal growth that are no longer valid. The whole business-theory and our economic society and market-model, is intoxicated by the idea of “borrowing capital on the base of future earnings”. Being an amateur in the field, common sense tells me that if a company or a country borrows money to finance their business they automatically need to have revenue that provides enough surplus to pay their mortgages and interests. In a confined environment, one earth, growth is only possible until we reach the limit, and as said before we are well over that limit already, which of course is not sustainable. Unsustainable “things” – will eventually Stop! So! – What are we going to do? Simple answer – We are going to react! It is not going to be easy, it is going to be costly, it is going to be late, but history and the human behaviour of self-preservation show that this is the way we do. The big question is; When do we start? A lot of research show that the “window” for change is rapidly closing. We have probably no more than ten years when we need to radically change our way of life and bend the rapidly soaring trend-curves downwards – means we need to start now! More and more companies are increasing their focus on sustainability. Many have started to monitor their performance, adding GRI-reporting, membership in CDP etc. which of course is a good way to start, but considering that we need a major transformation of the way we live on this earth, and unless these first steps quickly leads into a more thorough screening of the way a company operates, it might just lead to a false belief that “Being less bad means that we are good?”. At the same time the cost and threshold for “real change” is getting higher and higher. In the face of an upcoming change many look back to history for guidance on how to react – problem here is that moving from the Holocene era into the Anthropocene, as we are doing now, equals moving to a state where mankind has never been before. The journey that we are in for is not going to be easy. There are going to be enormous obstacles and difficulties but also big opportunities. Every “inflated” bubble that bursts, “the IT-Bubble”, “the Real-Estate bubble” etc. and now the “Fossil-Fuel bubble” have losers and winners. Make sure you are a winner – Act today!